If you Counterattack an opponent's Infantry Assault card, must you order your Infantry Assault in the SAME section that your opponent ordered OR may the Infantry Assault be ordered in any section that you prefer. 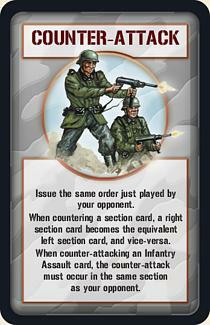 The reason I ask is that in Memoir '44 the rule is that the Counterattack must take place in the SAME section. So one C&C game plays one way and the other C&C game plays the other. Nothing conclusive then??? "Follow the instructions on that card as though you were actually playing it, except reverse any section references made on the card"
1) as though you were actually playing it --> you can chose ANY section as you would do if playing that card from your hand. 2) the exception about reverse section is applied only if it's referenced on the card. I think you are correct. 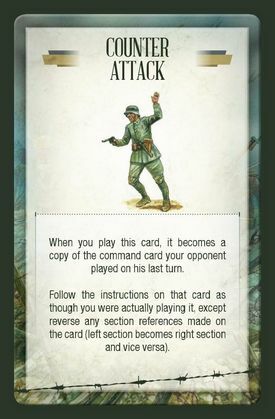 If we just read the rules as written there is no limitation on TGW card for playing Infantry Assault where on the Memoir '44 card it is stated explicitly.